This patient’s history dated back to 1 year prior to presentation. He had acute pancreatitis of uncertain cause. He did not drink alcohol and no gallstones were identified. He did develop a pancreatic pseudocyst following which was followed by CT and thought to be diminishing in size. He was in his normal state of health prior to this with no significant past medical history. He became fatigued after the pancreatitis. His wife then noticed reduced facial expression and some confusion, such as misplacing his billfold and being unable to find it. Clear episodes of amnesia or memory loss were difficult to specify. He discontinued driving because of these problems and being bothered by the movements of cars and the car lights bothering his eyes. The patient reported slowness of movement, trouble with balance, rare twitching of muscles, and mild stooped posture, photosensitivity, mild lightheadedness on standing, and hypophonia. He reported increased startle and a few jerks occurring during sleep. He also reported a few screams at night but there was no strong suggestion of REM sleep behavior disorder. He denied tremors, micrographia, muscle stiffness, trouble with eye movements, neck stiffness, motor weakness, dysphagia, dysarthria, shuffling, reduced arm swing, involuntary wandering of arm or leg, excessive drooling, erectile dysfunction, tinnitus, tongue biting, anhidrosis, repeating himself, forgetfulness during mid-sentence, fluctuating cognition, difficulty falling asleep, trouble recognizing familiar faces, hallucinations, problems reading, writing, or spelling, problems with language, déjà vu, loss of emotion, or behavioral dyscontrol. His past medical history was remarkable for hypertension, possible depression, and the episode of pancreatitis. His medications on presentation were venlafaxine 75 mg once daily and metoprolol 25 mg twice daily. He was a lifetime nonsmoker, did not drink alcohol, and had no history of illicit injection drug use or significant travel history. His paternal grandfather had a tremor and carried a diagnosis of Parkinson disease. Two second-degree relatives had multiple sclerosis. On neurologic examination, he was bradyphrenic and made two errors on orientation. Language was normal to comprehension and repetition. On naming, he made one semantic paraphasic error, saying “clothesline” instead of “clothes peg.” Verbal reasoning and abstract interpretation was normal. He could read without problem but could not calculate. Visuospatial and visual perceptual testing were significantly impaired. On episodic memory testing, he learned four items with one trial, recalled two of four spontaneously, and four of four with cueing. Digit span was six. Praxis testing was normal and he had no frontal release signs. He had facial hypomimia and mild neck rigidity without extremity rigidity. Alternating motion rates on the left were minimally bradykinetic. There was no rest or postural tremor but he had a very mild intention tremor. He had dysdiadochokinesia affecting his upper and lower extremities left much greater than right. His reflexes were normal symmetrically and plantar responses were bilaterally flexor. Sensory examination was normal. Normal or negative tests included complete blood count and differential, serum electrolytes, amylase, fasting glucose, creatinine, liver and renal functions tests, erythrocyte sedimentation rate, C-reactive protein, vitamin B12, folate, ceruloplasmin, serum protein electrophoresis, HIV, thyroid stimulating hormone, thyroperoxidase antibodies, lactate dehydrogenase, lactate, ammonia, antinuclear antibodies, antibodies to extractable nuclear antigen, antineutrophil cytoplasmic antibodies, myeloperoxidase, proteinase 3, prostate specific antigen, syphilis, Lyme, paraneoplastic antibody panel, GAD-65 antibodies, urine amino and organic acids. Serum lipase was elevated at 180. West Nile virus (WNV) IgG was positive; IgM was only equivocal. CSF showed white blood cells 1.0/μL, red blood cells 0.0/μL, glucose 56 mg/dL, protein elevated at 62 mg/dL, IgG index 0.56. PCR negative for varicella zoster, herpes simplex, cytomegalovirus, Ebstein Barr virus. CSF WNV, cryptococcus Gram stain, fungal stain, cytology and paraneoplastic screen negative. Neuron specific enolase was elevated at 59.6 ng/mL, 14-3-3 protein <2.0 ng/mL. Head MRI showed mild generalized cerebral and cerebellar atrophy with increased T2 signal involving the cortex of the anterior right frontal lobe, mid and upper pons, and a few punctate foci in the white matter of both cerebral hemispheres all without gadolinium enhancement. Diffuse increased diffusion signal involving the cortex of the right occipital lobe extending into the right parietal and posterior right temporal lobes, with more subtle involvement of left posterior and left paramedian occipital cortex was seen (figure 1) with associated FLAIR signal change in the same regions. MRI head with diffusion weighted (A) and FLAIR (B) images demonstrating increased diffusion and T2 signal involving the cortex of the right occipital lobe extending into the right parietal and posterior temporal lobes and more subtle involvement of left posterior and left paramedian occipital cortex. An abdominal CT showed a tiny cystic-appearing lesion in the uncinate process of the pancreas, likely representing a pseudocyst. A movement disorder laboratory evaluation showed the acoustic startle response was within normal limits. An EEG showed moderate diffuse nonspecific slowing with no activation during the sleep recording. A formal neurocognitive assessment was clearly abnormal with moderate cognitive dysfunction. The most significant abnormalities included slowed mentation, cognitive inefficiency, and compromised executive functions. Memory retention was poor, but showed relatively minor impairment compared with his other deficits. His verbal intelligence was normal while his nonverbal intelligence was impaired. A CT chest and abdomen 2 months following presentation showed a normal pancreas except for the unchanged fatty area in the uncinate process without evidence of pseudocyst. Tiny left kidney cysts were noted as were some calcified lung granulomas and hilar nodes. A tiny oval nodular opacity right middle lobe of uncertain significance was also seen. Two months following his assessment his clinical examination was unchanged. It was noted that the patient lacked insight into the severity of his impairment. The patient died 3 months after presentation; a diagnostic autopsy was performed. A 54-year-old man develops pancreatitis and shortly thereafter develops a myriad of progressive symptoms. In discussing the case, I will first present his symptoms and progression discussing the possible neuroanatomic localization. Next, I will discuss the differential and my approach for the evaluation of a rapidly progressive dementia. Finally, we will examine test results to see if they help us rule in or rule out certain diagnoses. We have a gentleman in his 50s with relatively rapid onset, less than 1 year, of cognitive problems, movement problems (slowness and “muscles twitching”), visual problems, and constitutional complaints (fatigue). His first symptom, fatigue, is quite nonspecific and could be attributed to recovery from the illness, depression, and many other causes. Next he developed a masked facies, possible parkinsonism. He has clear parkinsonism with bradykinesia and asymmetric problems with rapid alternating movement. On cognitive testing, visuospatial function is the most severely affected. He is also mildly disoriented, has some mild language problems related to naming, acalculia, and some verbal memory deficits. The asymmetry on his examination suggests asymmetric CNS involvement. Problems with naming and calculations indicate left temporal lobe and the angular gyrus cortical involvement. Verbal memory deficits could be encoding problems from left hippocampal dysfunction or a retrieval problem from frontal-subcortical deficits. As his memory improved with cueing, this suggests he encoded memory and his hippocampi are intact; therefore his memory is more due to a frontal-executive deficit. The visual spatial problems indicate right parietal dysfunction. His attention (digit span) ability to participate in the tasks do not suggest a global encephalopathy. When evaluating a patient with a rapidly progressive dementia (RPD), a systematic approach is needed to prevent overlooking potential etiologies, particularly those that are treatable. For RPDs, I use a mnemonic, VITAMINS, which stands for vascular, infectious, toxic-metabolic, autoimmune, metastatic, iatrogenic, neurodegenerative, and systemic conditions. Multiple cortical and subcortical strokes is unlikely in our patient as his symptoms appeared subacutely. Vasculitis should be considered with multiple areas of CNS involvement. In an isolated CNS vasculitis, general laboratory findings are often normal,2 but brain imaging typically shows multifocal white and gray matter involvement with focal ischemia on diffusion weighted imaging, often with gadolinium enhancement.3,4 Infectious etiologies involving such focal cortical and subcortical areas but not causing other symptoms is unusual. Syphilis, HIV, and Lyme disease should be ruled out, particularly as these are treatable.5 Toxic-metabolic conditions causing cognitive impairment such as mercury, lead, or arsenic are often identified by a thorough history and a high degree of suspicion. Pancreatic encephalopathy typically occurs within a few weeks of pancreatitis. It can be acute or subacute in onset and can cause vision loss, focal weakness, ataxia, behavioral changes (e.g., agitation, hallucinations), and fluctuating confusion. His symptom progression and MRI are not consistent with pancreatic encephalopathy.6,7 Parkinsonism can occur from manganese toxicity, but cognitive dysfunction is unusual. Bismuth intoxication can cause multiple neurologic symptoms, including ataxia, myoclonus, and encephalopathy.8,9 Vitamin deficiencies, including thiamine or vitamin B12, should be considered. Adult presentations of childhood metabolic disorders can rarely appear as RPDs. Autoimmune conditions, either paraneoplastic or non-paraneoplastic, can cause a myriad of peripheral and central neurologic symptoms and always need to be considered in the setting of an RPD. Several antibody syndromes associated with paraneoplastic and non-paraneoplastic limbic encephalopathy that may cause this combination of cognitive impairment, myoclonus, and parkinsonism include Anti-Hu (ANNA-1), CV2 (CRMP5), Ma2/Ta, amphiphysin, Yo, Ri, Zic4, voltage gated potassium channel (VGKC) syndromes, and possibly some of the novel cell membrane antigens (cMAg).10,11 A body CT with and without contrast are generally necessary. When a tumor is not identified but suspected a PET scan may be helpful. In autoimmune-associated encephalopathies, brain MRI often reveals T2-weighted hyperintensities in varying locations depending on the antibody, but are typically in the medial temporal lobes or less commonly basal ganglia.11 Hashimoto encephalopathy (HE) (sometimes referred to as steroid response encephalopathy associated with autoimmune encephalopathy [SREAT]) should also be considered. HE is an encephalopathy associated with anti-thyroglobulin or anti-thyroperoxidase antibodies and thyroiditis. Patients can be hypo-, hyper-, or euthyroid, although the diagnosis can only be made once thyroid dysfunction has been corrected. HE is often associated with rapid but fluctuating cognitive decline, myoclonus, ataxia, hallucinations, and seizures. EEGs can show slowing or periodic sharp wave complexes. Although essentially a diagnosis of exclusion, it is important to consider as it is typically very responsive to high dose steroids or other immunosuppresion.12,13 Anti-GAD65 antibodies have been associated with rapidly progressive ataxia and mild cognitive impairment.14 Metastatic causes of RPD are typically identified by body and brain imaging. Iatrogenic causes of RPD require a thorough review of medication history, usage, and drug-drug interactions. Neurodegenerative diseases would certainly fit our patient’s syndrome, which is consistent with an atypical parkinsonian dementia, but somewhat rapid. The frontal executive cognitive impairment with parkinsonism (asymmetric), visual abnormalities, and visual spatial dysfunction has overlap with dementia with Lewy bodies (DLB) and cortical basal degeneration (CBD). Favoring a diagnosis of DLB are the parkinsonism, visual spatial dysfunction, and cognitive deficits, although we do not have a history of visual hallucinations, fluctuating consciousness, or REM behavior disorder, which often occur in DLB. Consistent with CBD, our patient has parkinsonism, asymmetric problems with rapid alternating movement, some language problems, frontal executive dysfunction, and myoclonus. His visual complaints could be indicative of a posterior cortical atrophy syndrome (PCA), often due to AD pathology; however, the neurologic examination does not suggest this PCA syndrome.15 Although both DLB and CBD can have rapid declines compared to AD, the speed of this man’s decline would be unusual. The combination of relatively rapidly progressive multifocal cortical and subcortical findings, including cognitive impairment, parkinsonism, myoclonus, exaggerated startle response, visual disturbance, and ataxia, are very suggestive for prion disease or Creutzfeldt-Jakob disease (CJD). The family history is concerning for the presence of neurologic disease, but not clearly indicative of a pattern or specific condition. Laboratory assessment ruled out electrolyte imbalance, B12 or thyroid deficiency, and hepatic or renal dysfunction. Because of the patient’s relatively young age and rapid progression, rare causes of dementia ranging from infectious (Lyme, HIV, meningitis, syphilis) to autoimmune (lupus, rheumatoid factor, anti-thyroperoxidase antibodies, anti-GAD65, paraneoplastic syndrome) disorders were essentially ruled out. Anti-thyroglobulin antibodies were not sent, however, so one cannot completely rule out HE. His elevated serum lipase is consistent with his recent pancreatitis. The elevated WNV IgG, but equivocal IgM, suggests exposure to WNV, but not active disease. Furthermore, his CSF did not show evidence of WNV and his constellation of neurologic symptoms would not be consistent with WNV infection. Appropriately, several childhood metabolic disorders presenting in adulthood were ruled out with normal urine amino and organic acids. WHO revised criteria and our current UCSF criteria (still being modified) for probable sporadic CJD are compared in the table.19 The WHO criteria are widely accepted, but have significant shortcomings. They require either a typical EEG during an illness of any duration or a positive 14-3-3 CSF assay and a clinical duration to death <2 years. The 14-3-3 test may not have very high sensitivity and the specificity is questionable. In a cohort of more than 120 sporadic CJD subjects evaluated through UCSF, we found the 14-3-3 to have less than 50% sensitivity.16,17 The EEG is also not a very sensitive test for CJD, particularly in the early stages.20 Also, akinetic mutism only allows for very late diagnosis, as this occurs at the very end stage of prion disease. Furthermore, WHO criteria combine cerebellar and visual symptoms, yet the neuroanatomy and circuitry of cerebellar and visual symptomatology are distinct and although these features are common in CJD, there is no evidence they co-occur. UCSF criteria separate out visual and cerebellar symptoms, add a category of other focal cortical symptoms (e.g., aphasia, neglect, apraxia, acalculia), and replace the 14-3-3 test with a brain MRI consistent with CJD.18,21,22 This patient had three of the four WHO symptom groups, but did not fulfill the WHO criteria ancillary tests required for probable sCJD, as his EEG and 14-3-3 were not diagnostic. Our patient easily met UCSF CJD criteria, having five of six symptoms and a positive brain MRI. Given the family history of neurologic disease it would be prudent to test for a mutation in the prion gene, PRNP, to rule out genetic prion disease. This, and any other genetic testing, should of course only be done with appropriate genetic counseling. 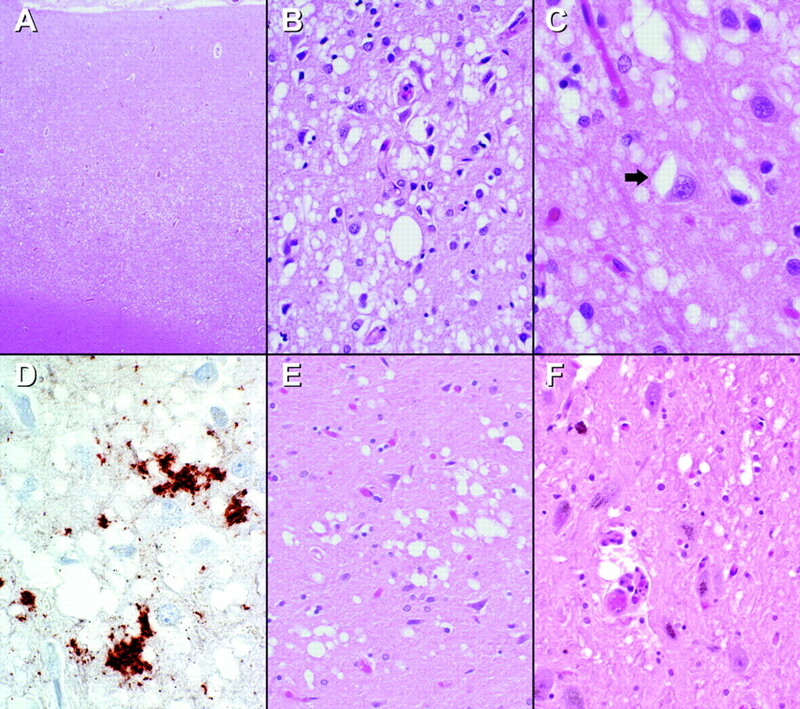 Human prion disease, consistent with sporadic CJD, with MV1 PrPSc. This patient presented with an interesting phenotype with features of parkinsonism, ataxia, and visual perceptual and spatial difficulties. Very few diseases would cause this combination of symptoms; however, diseases that fall into the differential diagnosis are outlined by Dr. Geschwind. Multiple system atrophy can cause ataxia and parkinsonism but not visual perceptual and spatial deficit. LBD was unlikely without hallucinations or REM sleep behavior disorder, and the presence of ataxia. Given that the majority of his cortical problems were posterior, a posterior cortical atrophy variant of AD was considered but again was unlikely given the early onset of parkinsonism and ataxia. We believed that CJD was the most likely diagnosis and the MR imaging was highly consistent with that diagnosis. Disclosure: The authors report no conflicts of interest. Cummings J. Frontal-subcortical circuits and human behavior. Arch Neurol 1993;50:73–80. Josephson SA, Papanastassiou AM, Berger MS, et al. The diagnostic utility of brain biopsy procedures in patients with rapidly deteriorating neurological conditions or dementia. J Neurosurg 2007;106:72–75. Moritani T, Hiwatashi A, Shrier DA, Wang HZ, Numaguchi Y, Westesson PL. CNS vasculitis and vasculopathy: efficacy and usefulness of diffusion-weighted echoplanar MR imaging. Clin Imaging 2004;28:261–270. Lee SY, Chu K, Park KI, Jeong SW, Yoon BW. Diffusion-weighted MR findings in isolated angiitis of the central nervous system (IACNS). Acta Neurol Scand 2003;108:346–351. Geschwind MD, Jay C. Assessment of rapidly progressive dementias. Concise review related to chapter 362: Alzheimer’s disease and other primary dementias in Harrison’s Textbook of Internal Medicine [online]. Available at: http://harrisons.accessmedicine.com/. Accessed June 6, 2007. Ruggieri RM, Lupo I, Piccoli F. Pancreatic encephalopathy: a 7-year follow-up case report and review of the literature. Neurol Sci 2002;23:203–205. Boon P, de Reuck J, Achten E, de Bleecker J. Pancreatic encephalopathy. A case report and review of the literature. Clin Neurol Neurosurg 1991;93:137–141. Jungreis AC, Schaumburg HH. Encephalopathy from abuse of bismuth subsalicylate (Pepto-Bismol). Neurology 1993;43:1265. Le Quesne PM. Metal-induced diseases of the nervous system. Br J Hosp Med 1982;28:534–538. Bataller L, Kleopa KA, Wu GF, Rossi JE, Rosenfeld MR, Dalmau J. Autoimmune limbic encephalitis in 39 patients: immunophenotypes and outcomes. J Neurol Neurosurg Psychiatry 2007;78:381–385. Vernino S, Geschwind MD, Boeve B. Autoimmune encephalopathies. The Neurologist 2007;13:140–147. Chong JY, Rowland LP, Utiger RD. Hashimoto encephalopathy: syndrome or myth? Arch Neurol 2003;60:164–171. Seipelt M, Zerr I, Nau R, et al. Hashimoto’s encephalitis as a differential diagnosis of Creutzfeldt- Jakob disease. J Neurol Neurosurg Psychiatry 1999;66:172–176. Chang CC, Eggers SD, Johnson JK, Haman A, Miller BL, Geschwind MD. Anti-GAD antibody cerebellar ataxia mimicking Creutzfeldt-Jakob disease. Clin Neurol Neurosurg 2007;109:54–57. Black SE. Focal cortical atrophy syndromes. Brain Cogn 1996;31:188–229. Geschwind MD, Haman A, Torres-Chae C, Raudabaugh BJ, Devereux G, Miller BL. CSF findings in a large United States sporadic CJD cohort. Neurology 2007;68 (suppl 1):A142. Geschwind MD, Martindale J, Miller D, et al. Challenging the clinical utility of the 14-3-3 protein for the diagnosis of sporadic Creutzfeldt-Jakob disease. Arch Neurol 2003;60:813–816. Young GS, Geschwind MD, Fischbein NJ, et al. Diffusion-weighted and fluid-attenuated inversion recovery imaging in Creutzfeldt-Jakob disease: high sensitivity and specificity for diagnosis. AJNR Am J Neuroradiol 2005;26:1551–1562. WHO Global surveillance, diagnosis and therapy of human transmissible spongiform encephalopathies: Report of a WHO consultation. In: World Health Organization: Emerging and other communicable diseases, surveillance and control. Geneva: WHO; February 9–11, 1998. Collins SJ, Sanchez-Juan P, Masters CL, et al. Determinants of diagnostic investigation sensitivities across the clinical spectrum of sporadic Creutzfeldt-Jakob disease. Brain 2006;129:2278–2287. Shiga Y, Miyazawa K, Sato S, et al. 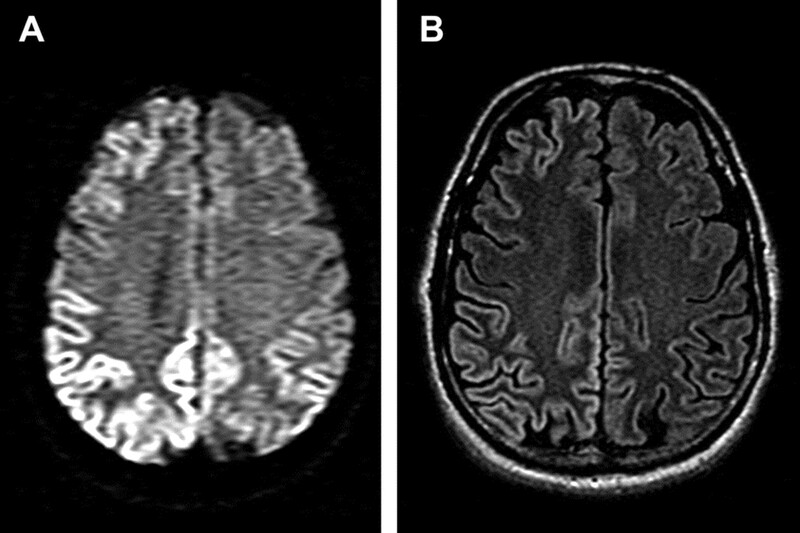 Diffusion-weighted MRI abnormalities as an early diagnostic marker for Creutzfeldt-Jakob disease. Neurology 2004;63:443–449. Tschampa HJ, Kallenberg K, Urbach H, et al. MRI in the diagnosis of sporadic Creutzfeldt-Jakob disease: a study on inter-observer agreement. Brain 2005;128:2026–2033. Brown P, Wolff A, Gajdusek DC. A simple and effective method for inactivating virus infectivity in formalin-fixed tissue samples from patients with Creutzfeldt-Jakob disease. Neurology 1990;40:887–890. Budka H, Head MW, Ironside JW, et al. Sporadic Creutzfeldt-Jakob disease. In: Dickson DW, ed. Neurodegeneration: The molecular pathology of dementia and movement disorders. Basel: ISN Neuropath Press; 2003:287–297. Parchi P, Giese A, Capellari S, et al. Classification of sporadic Creutzfeldt-Jakob disease based on molecular and phenotypic analysis of 300 subjects. Ann Neurol 1999;46:224–233.